Is Dividend Aristocrat Exxon Mobil Corporation (XOM) A Good Investment? A whopping number of 13F filings submitted to the U.S. Securities and Exchange Commission has been processed by Insider Monkey so that individual investors can look at the overall hedge fund sentiment towards the stocks included in their watchlists. These freshly-submitted public filings disclose money managers’ equity positions as of the end of the three-month period that ended June 30, so let’s proceed with the discussion of the hedge fund sentiment on Exxon Mobil Corporation (NYSE:XOM). Several hedge funds were selling Exxon Mobil during Q2, as there was a 12% decline in the number of funds that owned the stock. One of Hedge Funds’ 5 Favorite Dividend Stocks With 4%+ Yields, Exxon Mobil Corporation (NYSE:XOM) also ranks as one of only two dividend aristocrats in the energy sector, alongside Chevron Corporation (NYSE:CVX). Exxon Mobil has paid out dividends for 36 consecutive years, which landed it a place on our list of the 25 Best Dividend Stocks for Retirement. 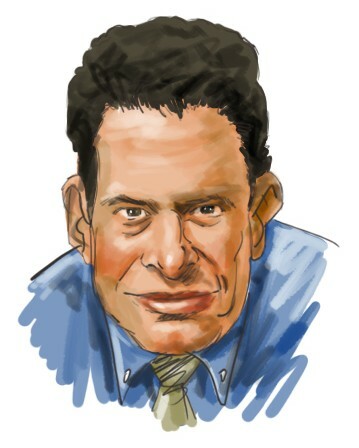 Billionaire Ken Fisher’s Fisher Investments owned $564 million worth of Exxon Mobil shares on September 30. In the financial world there are a large number of tools investors have at their disposal to grade stocks. A pair of the most under-the-radar tools are hedge fund and insider trading indicators. We have shown that, historically, those who follow the top picks of the best fund managers can outperform the broader indices by a solid amount. Insider Monkey’s flagship best performing hedge funds strategy returned 17.4% year to date and outperformed the market by more than 14 percentage points this year. This strategy also outperformed the market by 3 percentage points in the fourth quarter despite the market volatility (see the details here). That’s why we believe hedge fund sentiment is a useful indicator that investors should pay attention to. At Q3’s end, a total of 50 of the hedge funds tracked by Insider Monkey held long positions in this stock, a 12% decline from the second quarter of 2018. 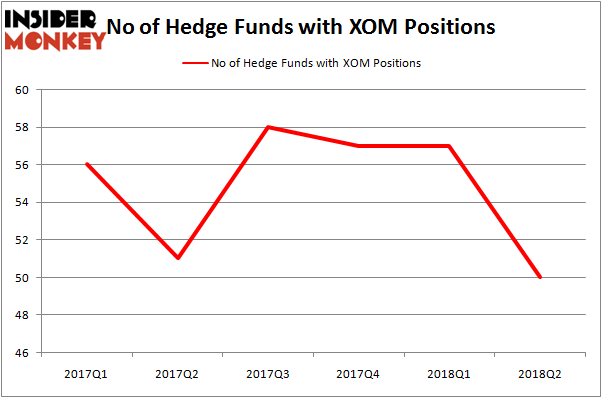 The graph below displays the number of hedge funds with bullish position in XOM over the last 6 quarters. So, let’s find out which hedge funds were among the top holders of the stock and which hedge funds were making big moves. More specifically, Ken Fisher’s Fisher Asset Management was the largest shareholder of Exxon Mobil Corporation (NYSE:XOM), with a stake worth $465.5 million reported as of the end of June. Trailing Fisher Asset Management was Pzena Investment Management, which amassed a stake valued at $373.3 million. Glaxis Capital Management, Skybridge Capital, and Lucas Capital Management were also very fond of the stock, giving the stock large weights in their portfolios. Since Exxon Mobil Corporation (NYSE:XOM) has faced bearish sentiment from the smart money, we can see that there is a sect of money managers that elected to cut their positions entirely in the second quarter. Interestingly, John Overdeck and David Siegel’s Two Sigma Advisors dumped the biggest investment of the “upper crust” of funds watched by Insider Monkey, totaling about $114.3 million in call options. Mike Masters’ Masters Capital Management was right behind this move, as the fund cut about $74.6 million worth. These bearish behaviors are intriguing to say the least, as aggregate hedge fund interest fell by 7 funds in the second quarter. Let’s now review hedge fund activity in other stocks – not necessarily in the same industry as Exxon Mobil Corporation (NYSE:XOM) but similarly valued. We will take a look at Johnson & Johnson (NYSE:JNJ), Royal Dutch Shell plc (ADR) (NYSE:RDS), Visa Inc (NYSE:V), and Bank of America Corp (NYSE:BAC). This group of stocks’ market valuations are closest to XOM’s market valuation. As you can see these stocks had an average of 81 hedge funds with bullish positions and the average amount invested in these stocks was $11.91 billion. That figure was $2.22 billion in XOM’s case. Visa Inc (NYSE:V) is the most popular stock in this table. On the other hand Royal Dutch Shell plc (ADR) (NYSE:RDS) is the least popular one with only 39 bullish hedge fund positions. Exxon Mobil Corporation (NYSE:XOM) is not the least popular stock in this group but hedge fund interest is still below average and declining. This is a slightly negative signal and we’d rather spend our time researching stocks that hedge funds are piling on, though XOM is the perfect stock to help diversify a dividend portfolio.